Mt. 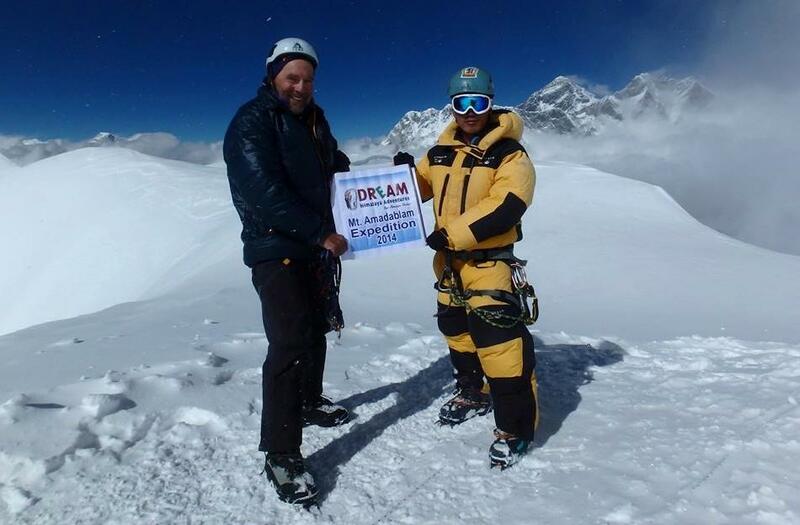 Ama Dablam Expedition is more than just a climb. It's a journey into the heart of the Himalayas. Located in the Khumbu valley of Nepal, only 12 km from the summit of Mount Everest, AmaDablam demands the attention of every passer-by. Soaring ridgelines and super-steep faces guard the summit from all but the experienced climber. From the summit you are surrounded by a vista of peaks like the five of the highest peaks in the world are clearly visible. Mt. Ama Dablam first ascent (via the SW ridge) was not made until the mid 60's by a strong NZ/USA team. The north ridge fell to a talented French team as late as 1979. 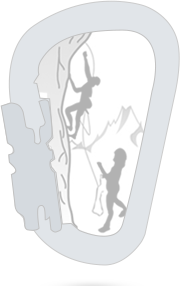 In recent years many parties have successfully climbed the mountain, with nearly all ascents via the original SW ridge route. Our ascent will also be made via the conventional SW ridge route, a technical route that requires 3500m of fixed ropes and three camps above base camp. The climbing with thisroute involves pure rock climbing on exquisite granite followed by mixed snow and rock climbing. The last section to the summit involves ice climbing followed by a long steep snow slope: often ropes are employed all the way to the summit. The reasons for this are three-fold: safety, speed and success. Due to the technical nature of the route, ropes will be fixed for most of the climb above camp one. A good working knowledge of abseiling and use of mechanical ascenders (jumars) is mandatory; prior experience is required. Objective dangers on the SW Ridge route is minimal, ice cliffs do not threaten it, the snow slopes are generally stable (with minimal avalanche risk), the rock is of good quality and the mountain is below the reach of jet stream winds. The route is extremely exposed and mistakes with rope work can be unforgiving. For this reason we have a low client: guide ratio and use experienced guides to keep you safely on track. Your guide(s) will be involved in the fixing of rope and the smooth running of the expedition but their primary concerns are client safety, best service and success. Island Peak "ImjeTse", 6,160meter has an impressive, highly glaciated West Face, which rises from the Lhotse Glacier. 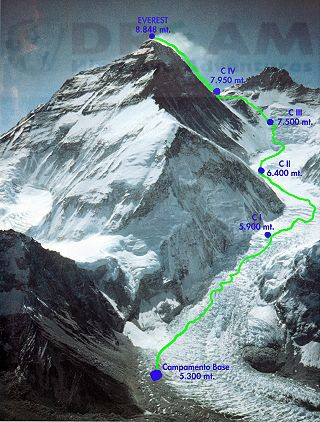 In fact, the mountain extends from the South Ridge of Lhotse Shar and is separated only by a small col. Above this gap is the ridge leading to summit. 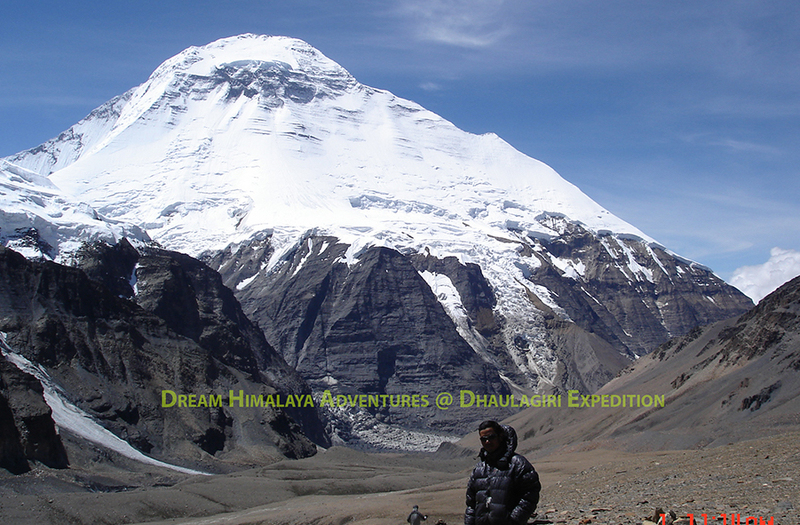 From base camp, we will ascend a steep, grassy slope and small rocky steps to high camp. 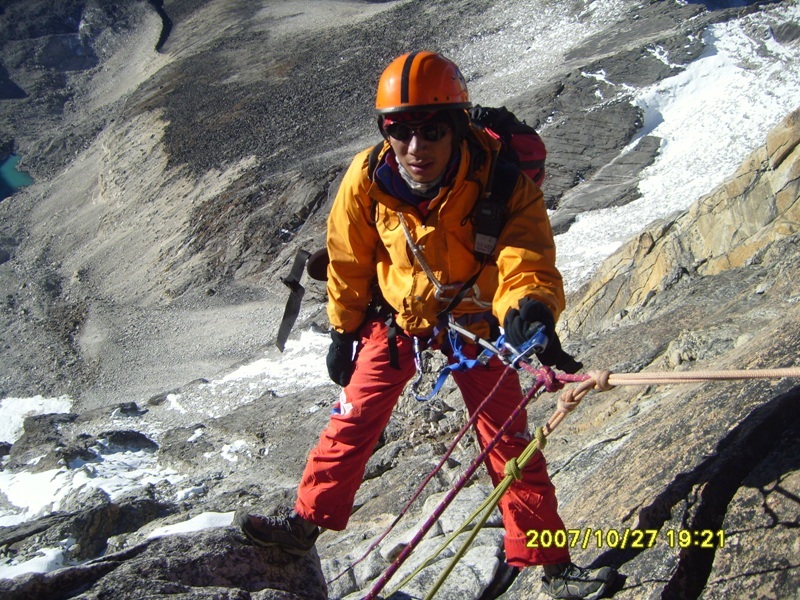 It is necessary to climb a steep, exposed 300 meters of snow and ice ramp to the summit ridge; fixed ropes will be used at this point in an otherwise, non-technical snow climb. We will negotiate a final tricky snow pitch before reaching the summit. Again, stunning views of the surrounding mountains can be seen from the peak, including Nuptse, Lhotse, Cho Polu, Makalu, AmaDablam and Baruntse. 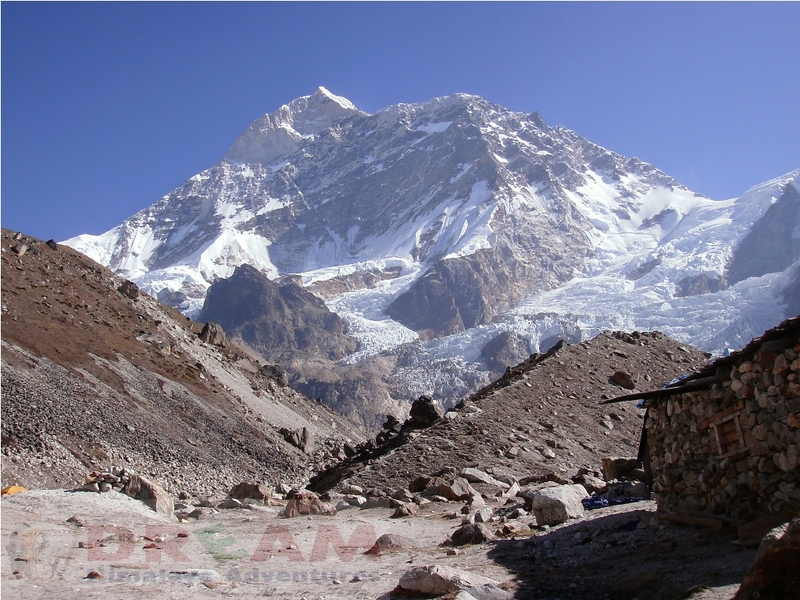 Base camp (4600 m): Situated on a large meadow with a wonderful views of the Imja valley. To camp I (5,795m): Our first real camp is only one and half-hours walk above Yak camp. This section is marked by rock cairns and involves boulder hopping and some easy scrambling. We sometimes fix couple of sections with rope to be used as a handrail. CampII (5,980m): This section of the route is usually rock climbing only, depending on the season. The granite is high quality and the moves fun, challenging and exposed but “do-able”. We follow a narrow ridge, switching back and forth on each side of the ridge. This is the hardest rock climbing of the entire route. In places the exposure is extreme and you are very thankful of the fixed ropes in place. Whilst it is generally easier not to pull on the ropes all the time if you are finding the going getting a bit too hard you can just rest on the fixed rope. You can also use your jumar to help you over the odd spot of difficulties. Most of the climbing on this section is traversing on rock, so good rock-climbing skills will help you move efficiently and quickly over this terrain. Camp two: Situated on top of the YellowTower on a narrow platform this campsite is rather exposed and has fantastic views. If you dropped your cup from here it would probably land in base camp! CampIII (6,440m): Now for the hardest snow and ice pitches of the route. We follow a system of steep snow and ice gullies up to join a feature called the Mushroom Ridge. Whilst the ridge itself is not as technical as the gullies leading up to it, the exposure here is palpable. 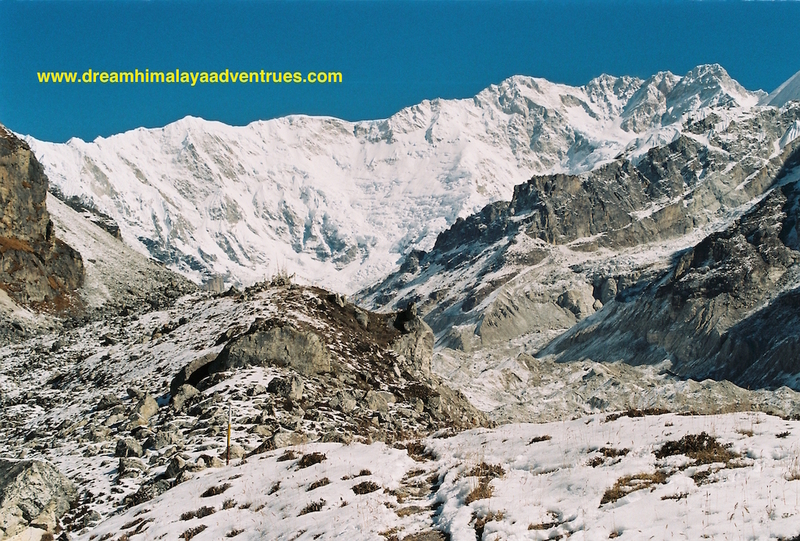 It is a narrow, windy, snow mushroom-like ridge with giant Himalayan peaks in the background. This feature leads us up onto a small plateau at 6300 m, which serves the purpose of camp three. Camp three: A cold and exposed position is the start of our summit push. The Sherpas will often use a full climbing rope to tie our tents down as the natural shape of the mountain can at times unfortunately funnel the wind to this location. It is however the only safe flat piece of real estate within range of the summit. Summit Day: The initial route is to the right of the huge “dablam” (ice cliff), up a moderately steep slope, which is often iced. Once past this feature we move toward the centre of the face. The angle eases slightly and a couple of tough hours later we emerge on the summit (6,812m). The summit is the size of a tennis court and allows us to move around and take pictures. Five of the world’s six highest peaks are clearly visible, with many other 7000m and lesser peaks filling the gaps. In the morning after breakfast, we will organize half day sightseeing tour during which you will be taken on memorable UNESCO Heritage Tour. Tour begins with visit to Nepal’s holiest Pashupatinath Temple Complex and takes us through Nepal’s largest Bouddhanath Stupa and 2500 years old Swoyambhunath Stupa. We will return to hotel in the afternoon and time for shopping of any missing items, packing and getting ready for the trip. We will drive to domestic terminal of Tribhuvan Airport early in the morning and catch a flight from Kathmandu to Lukla. We will follow one of the most scenic air routes in the world with panoramic views of glistening mountains to Tenzing Hillary Airport in Lukla. 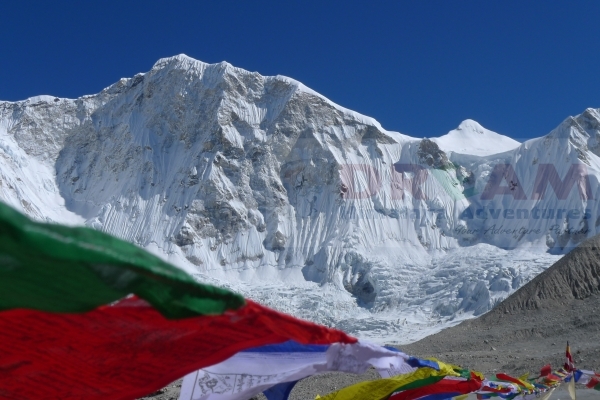 Lukla allows access to Everest Khumbu region. We will assemble the crew and take breakfast before start of Everest3 Passes Trek and Island Peak. Following the stone path through Ghat village, we will reach Phakding village. Visit local monastery. Stay overnight atPhakding. Leaving Phakding, we will walk along Dudhkoshi River and enter the dense pine forest. We will cross suspension bridges and walk through dispersed houses of Zapute, Benkar and Chumoa to reach Monjo. Monjo allows an entrance to Sagarmatha National Park. We need to go through required national park formalities before we can enter the park. The park is rich in Himalayan herbs, plants, mammals and birds. We will descend to Hillary Bridge existing at the base of hill. After crossing the bridge, we will follow the escalating path towards Namche Bazaar. The path rewards us with views of Thamserku Mountain, Everest, Lhotse and other mountains and peaks. Stay overnight in Namche Bazaar. Namche Bazaar acts as the major trade centre to conduct trade in between locals and neighbouring Tibetans. Namche is also popular as the capital of Sherpa land. It is wise to take rest at Namche on this day. For proper acclimatization with the changing altitude, we can arrange day hike to small Khumjung and Khunde villages. Visit the local monastery and observe the local lifestyle. Head office of National Park, Museum and monasteries are interesting places near Namche. We can get most of the modern facilities including hospital and post office at Namche. Stay overnight in Namche. The trail continues along glaciated DudhKoshi River from Namche. We will follow the scenic route with views of Everest, Nuptse, Lhotse and other peaks and mountains and enter the forest area. Walking through the colourful rhododendron forest, we can get opportunity to view musk deer and colourful Himalayn birds like Danphe and Munal. We will move further to Sanasa village. The trail branches at Sanasa. 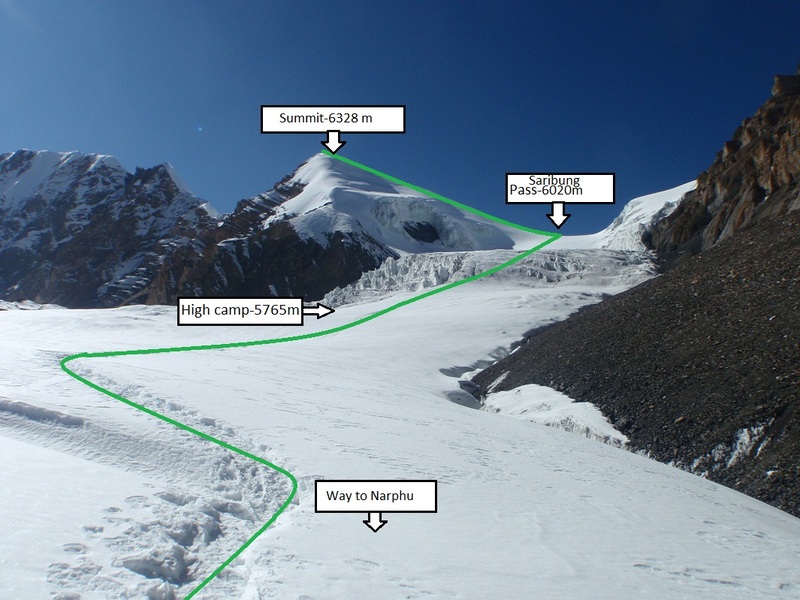 We will follow the main trail towards Everest Base Camp. Following the escalating path from Sanasa, we will reach Tengboche. Gate of Tengboche Monastery is open after 3pm. We will visit Tengboche Monastery which is the largest monastery in the region. Leaving Tengboche, we will enter the birch and rhododendron forest. In couple of hours, we will reach Debuche from where we will lower down to beautiful Chhukung Valley. We will descend to Imja River and follow the raised path to Pangboche. Monastery is Pangboche is believed to be the oldest Monastery in the region. Walking along the Mani walls, we will climb to Pheriche. Walking along Lobuche River, we will reach Dengboche village. Stay overnight in Dengboche. Taking rest from trek at Dengboche helps to break the stress. It also helps in proper acclimatization. We will take short walk to Nagarjuna View Point located at Nagarjuna Peak. 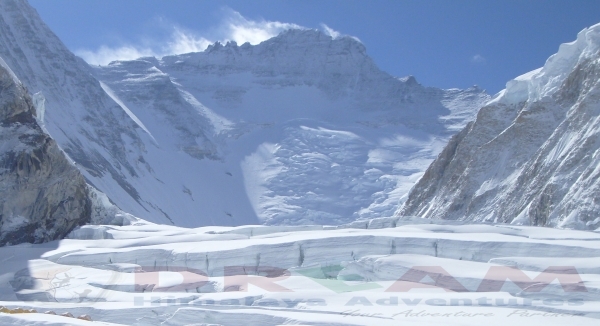 Enjoy the 360 degree mountain views of Makalu, Lhotse, Amadablam, Island Peak and other mountains. We will return to Dengboche for staying overnight. Leaving Dengboche, we will take brief walk to Chukung. The path is scenic with breath-taking views of Everest, Amadablam, Lhotse, Nuptse, Kwangdeand other peaks and mountains. Chukung is the entry point for Island Peak. We will explore this tiny village and check our climbing gears. Stay overnight at Chukung. Short trek from Chukung will take us to Base Camp of Island Peak. Heading south from Chukung, we will walk through Lhotse glacier along Imja and Lhotse glacier moraines. We will reach to the southwest edge of Island Peak which will be our camp site. Enjoy the spectacular views of surrounding mountains and moraine valley. We will stay overnight in Base Camp of Island Peak. After packing our essentials, we will begin our climb to the High camp of Island Peak. The slope continues to narrow and the trail enters a sloped rock channel. We will make our Camp nearby the rock channel. You will need to use crampons on this day. Follow the instructions of your guide properly for safety. The guide will share some quick last minute climbing technique. Stay overnight at High Camp. The trail continues to raise up from the rock gully. We need to climb series of short rock steps which will bring us to the right side of the drain. We will follow a ridgeline which will take us to the exposed traverse onto the snout of the summit glacier. We will need rope on this day. 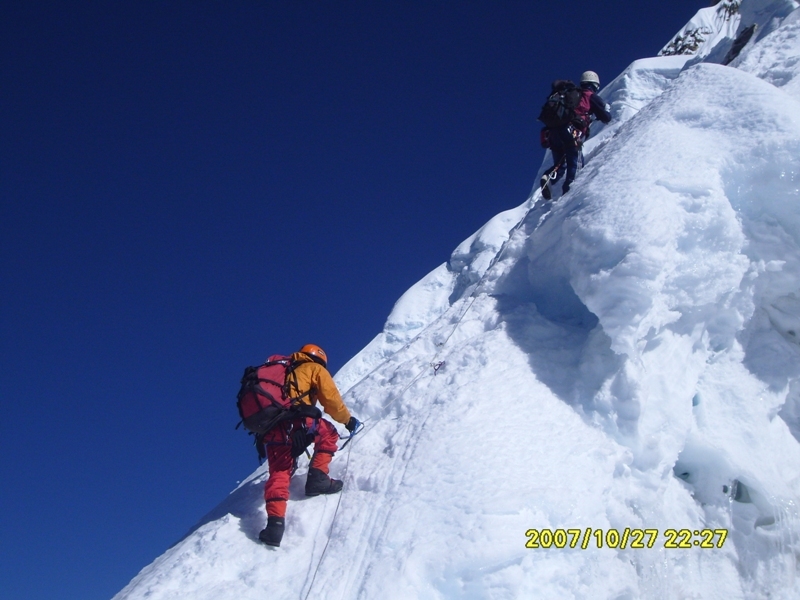 Moving through crevasses, we will climb 40 degree slope by help of rope and follow the ridge up to the summit. We will spend some time in summit enjoying the successful ascend of Island Peak and lower down to Base Camp where we will stay overnight. After making successful climb of Island Peak, we are all set to climb Amadablam. We will leave the base camp of Island Peak and return to Chukung from where we will descend to DingbocheBridge. We will continue walking to small Pangboche village. Visit Khumbu’s oldest Pangboche Monastery. We will stay overnight at Pangboche. 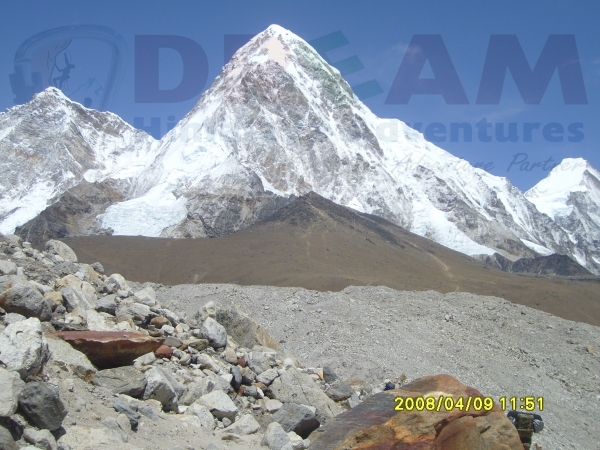 Enjoy the views of Amadablam, Lhotse, Everest and other peaks and mountains. Lowering down from Pangboche, we will arrive at river from where we will take steep climb to CholungcheKharka. 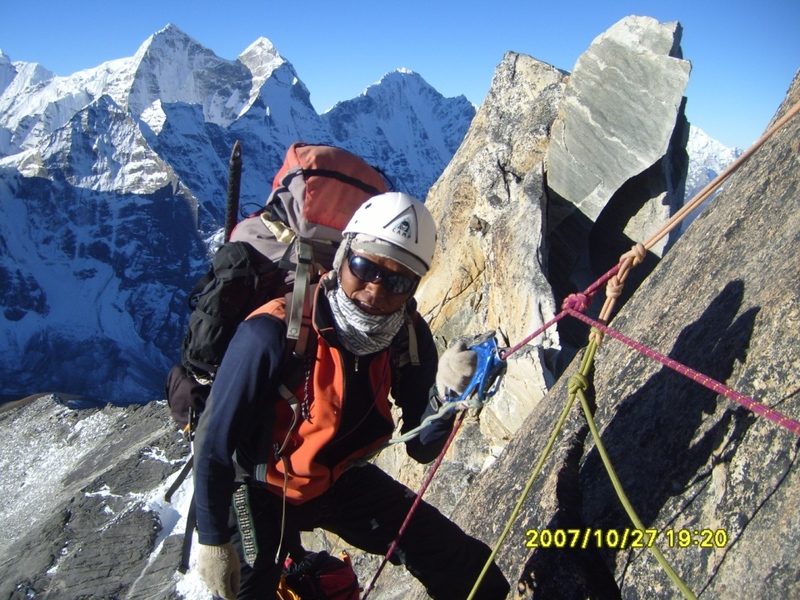 We will take steep climb from Kharka to Amadablam base camp (4600m). The path is scenic with panoramic views of Amadablam Mountain (6856m), Lhotse Mountain (8516m), NuptseMountain (7879m), Pumori Mountain (7165m),ThamserkuPeak (6623m), KangtegaPeak (6783m), KusumkangaruPeak (6367), Tabuche peak (6495m) and other peaks and mountains. The trail drops down to river before escalating uphill to AmadablamBaase Camp where we will stay overnight. We will choose the commercial SW ridge route to climb Amadablam. Leaving Base Camp,we will climb through rocks and walk along ridges. We may need to use fixed rope at some point. We will reach to Camp I in few hours. Your rock climbing skill is going to be tested on this section. Our journey continues through tapered ridge. We will proceed further with help of fixed ropes. The terrain is mostly covered in rocks and boulders. We will finally reach Camp II which is located on the top of Yellow Tower. We need to walk through ice and snow on this section. We will climb snow and ice gullies to reach Mushroom ridge where we will set Camp III. The site is exposed but not technical to reach. Camp III is located in a scenic site with panoramic views of mountains at the backdrop. We have to face the challenges of heavy wind from Camp III onwards. Leaving Camp III, we will follow the route that continues to the right of huge ice cliff. We will continue climbing through ice section to reach the summit. 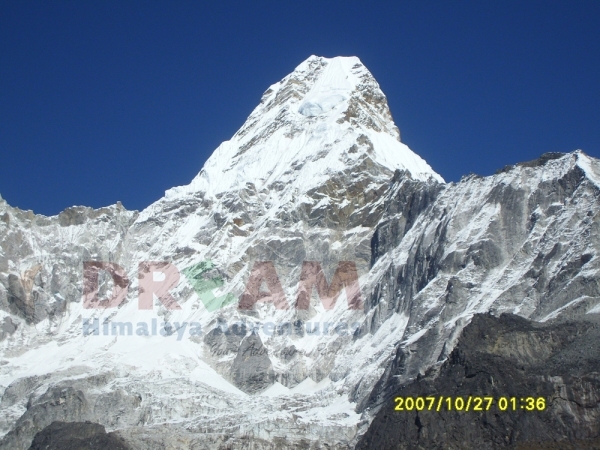 We can enjoy the views of five highest peaks in the world from the summit of Amadablam. We will descend gradually to the Base Camp. From Amadablam Base Camp, we will return back to Tengboche and walk past forest and settlements to Namche where we will stay overnight. From Namche, we will lower down to rhododendron forest and walk along Dudhkoshi River to Phakding. Walking past the walled road of Ghat, we will reach Lukla. Stay overnight in Lukla. We will catch an early morning flight from Lukla to Kathmandu. This is rest day. Spend the day as you like. You can go for shopping in Thamel where you can buy souvenir items. We can also arrange for guided sightseeing tour. Alternatively, you can arrange your photo albums and jot down memories in your journal. Stay overnight in a hotel in Kathmandu. Spend the day as you like. You can go for shopping in Thamel where you can buy souvenir items. We can also arrange for guided sightseeing tour. Alternatively, you can arrange your photo albums and jot down memories in your journal. Our 6,000m expedition peaks are more challenging than trekking peak climbing trips. Your tough level of fitness is really important for this trip; therefore we strongly suggest preparing yourself in good physical fitness level. You do not need to be an athlete, but a good level of overall fitness is important. Being fit will certainly improve your chances of reaching your chosen summit. As an indication, you should be able to walk 8 km / 5 miles with a maximum height gain of 800m/2,000ft with a 10kg rucksack in 5 hours or less. In order to get ready for this challenge, you need to be trained at least for about 5 to 7 months to prepare yourself as strong candidate. You can go to fitness center every morning for about 2 hours, do hiking every weekend with increasing weights on your pack (i.e. 7kg, 10kg, 13 kg, 16kg and up to 20kg), manage some time for cycling for couple of hours for 3 or 4 times a week. However during climbing, there might be little symptoms of an altitude illness like mild headache, fatigue etc. but take it as normal and just drink a lot of water (4 – 5 liters) every day. On this trek, youneed to be able to hike 6 – 10 hours over hilly terrain up to 6,000m of altitude with daypack. On the summit push, extra effort is required walking on ice and climbing up to 10 – 12 hours. 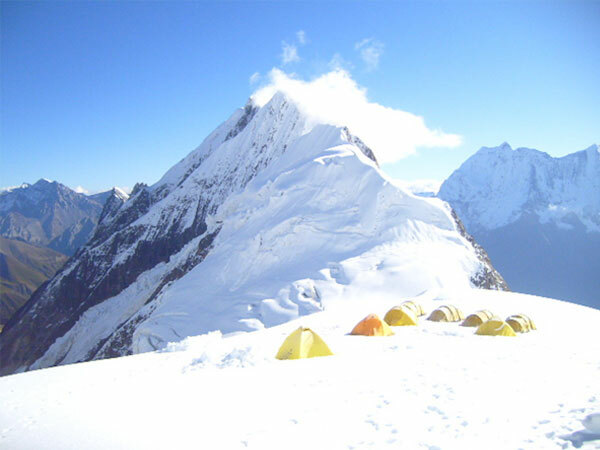 We will have porters to carry our heavy camping equipment, food and also the climbing gears. All of our 6000m expedition trips are accessible to experienced trekkers and those who have done some climbing trips in European mountains in order to take another challenge on the Himalaya's Mountains. This trip will be helpful if you want to gain some knowledge about the mountaineering and have future plan to climb BIG Mountains. 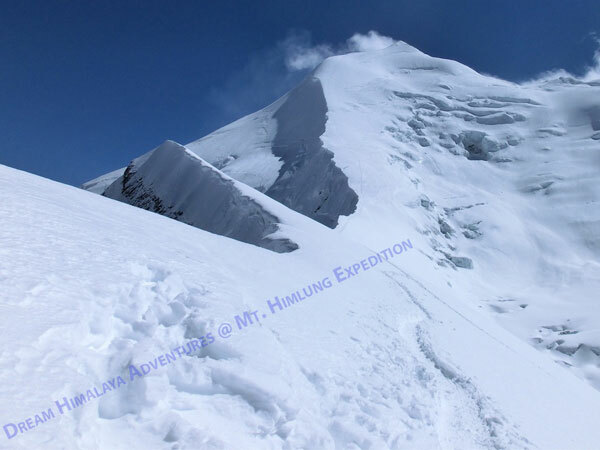 If you have any previous mountaineering experiences and well knowledge about how to play with mountaineering gears, good with rock climbing and ice climbing, will surely increase the chances of reaching thesummit andalso previous trekking and mountaineering experiences is mandatory but doesn’t require any technical experience. But if you are participating on one the technical climbing peak then you must have well knowledge about how to use the mountaineering climbing gears (i.e. crampon with boot, Ice axe, harness, ropes, jumars, prussiks, abseiling, moving past knots, anchor etc. ).Crampons are use for maximum grip and harness and ropes are use for maximum safety during climbing. But for those who have no mountaineering experience and skill but have gottough level of fitness, , you will be have basic training session by our guides about how to use the climbing gears during rest/acclimatization day. So we always make it sure regarding the safety of the team and successful climb of the peak.